Good players can move in all directions efficiently because they and use all edges and have great balance on the ice. 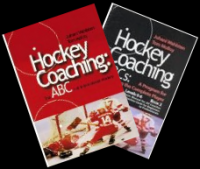 Routines for skating, puck handling, shooting and passing are efficient ways for a coach to quickly review the foundation skills and allow the players to get a lot of reps and improve at their own rate. A2 Formation - Players start at one end and skate to the other end.